Located in the trendiest new destination in the capital, the Pullman New Delhi Aerocity is the perfect mix of luxury and convenience. 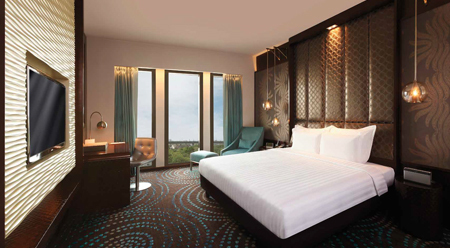 With close proximity to the Indira Gandhi International Airport and drivable distance to the prominent business hubs of Gurgaon and New Delhi, the hotel offers unparalleled accessibility. Business travellers will in particular appreciate the convenience of avoiding Delhi's infamous rush hour. 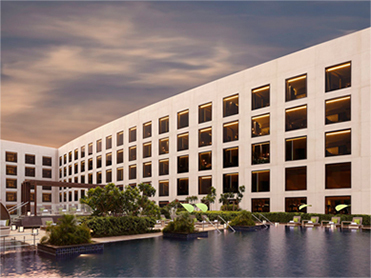 Pullman New Delhi Aerocity further offers state-of-the-art meeting rooms, one of the largest Ballrooms in the Delhi NCR region, a fully equipped business centre, a picturesque courtyard and much more. The hotel also houses multi-cuisine speciality restaurants to cater to the tastes of the ever evolving traveller. And if in mood to loosen up the tie after a full day of work, Pullman New Delhi Aerocity is ideally located in easy reach of all the major landmarks. 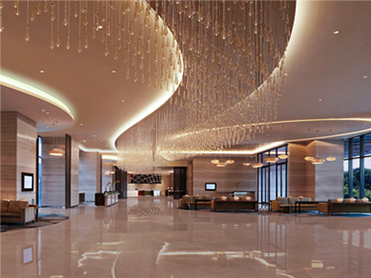 The Pullman New Delhi Aerocity is home to one of Delhi NCR’s largest un-pillared Ballrooms. Guests have the option of hiring out the entire hall of 1181sq.m. in total or in parts, as the ballroom may be partitioned into 3 separate halls. Also available are 13 meeting rooms, 3 boardrooms and a business centre, each aesthetically designed with state-of-the-art technology. 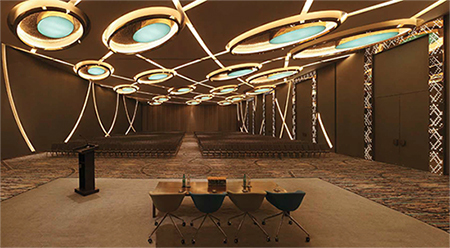 All meeting venues are equipped with hi-speed Wi-Fi internet access, high resolution ceiling projectors, cutting edge audio visual systems and a pre-function area with varied culinary stations. These versatile venues can be adapted to suit various size and format requirements with flexible seating layouts. For every event held at the hotel, dedicated event executives and an IT manager will be assigned to ensure the success of the same. 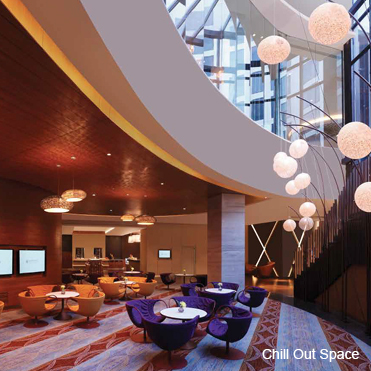 The Chill Out Space provides the perfect setting to unwind between meetings and conferences. Relish a cup of coffee from Café Pluck or just sit back and take a breather. The shared area also houses a gaming station for some much needed fun and entertainment. The meeting rooms open into the alluring courtyard. With its picturesque landscaping, the Courtyard is the perfect spot for some fresh air. With a capacity to accommodate up to 600 guests, this green setting serves as the ideal venue for some post meeting cocktails and more. The distinctive classy lounge offers exceptional service to the discerning guest, beginning with breakfast and complimentary use of boardrooms to express check-in and check-out. The lounge serves as a one-stop-shop for the guests at Pullman New Delhi Aerocity. Specifically designed to cater to the modern day traveller, the Hospitality Lounge at Pullman New Delhi Aerocity houses a mini bar, a coffee machine and tech savvy facilities. 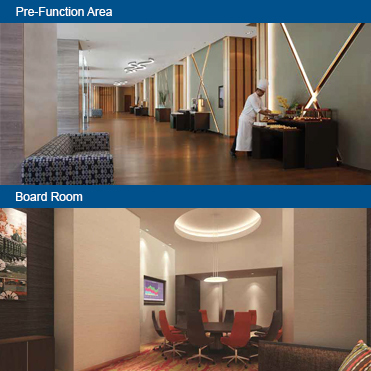 The warm interiors and the elegant furnishings add to the luxury of the Hospitality Lounge. 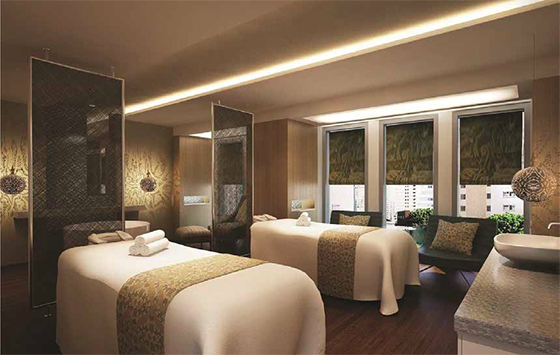 Woo Spa at Pullman New Delhi Aerocity, offers the most inviting and stress relieving experience. With a heated swimming pool set amidst luxury furniture from Dedon and an exclusive Poolside Bar, the pool deck provides the perfect setting to unwind and relax. Pluck - a modern day eatery with an in-house farm, Pluck offers a seasonal menu with freshly picked ingredients. Pling - An active fine dining luxury space, Pling transforms itself to a vibrant lux-lounge seating as the sun sets down. 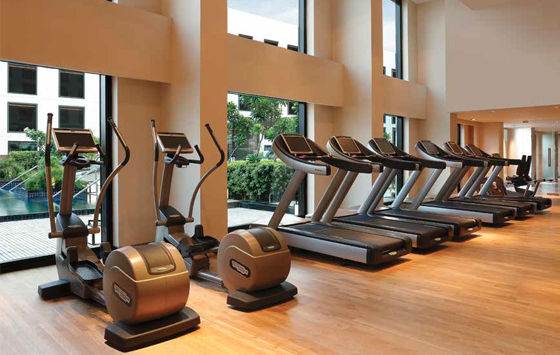 The Pullman New Delhi Aerocity also means business when it comes to the many fine-dining options on offer. Long meetings and presentations may be perfectly punctuated with a short break for contemporary delicacies at Café Pluck or a more elaborate spread at Pluck. Post the day’s meetings, unwind with a fine selection of wines and tapas at Pling or go in for some Asian street food cuisine at Honk. Café Pluck - a stylish go-grab delicatessen, Café Pluck offers an extensive range of tea, coffee and other beverages along with freshly baked goodies. In the evening the chic cafe doubles up into a dessert tapas bar. Honk - A bistro style restaurant serving Asian inspired street food cuisine, this restaurant at Pullman New Delhi Aerocity is the melting pot of flavours. Web: www.pullmandelhiaerocity.com How to get to the Hotel? From Terminal 3, drive along T3 Arrival Road till IGI T3 Road. Continue onto IGI Road Northern Access Road and after 1.8km, Pullman New Delhi Aerocity will be on your left. From Terminal 1D, drive along Terminal 1D Road and take the 2nd exit at the roundabout to Terminal 1D Road. Turn right to Northern Access Road, drive for 2.9km before turning left to IGI Road. Pullman New Delhi Aerocity will be on the left.